First Group has lodged the highest bid for the west coast rail franchise, making it the frontrunner to take over the prestigious London-to-Glasgow route. The bus, rail and coach group is believed to have pushed incumbent Virgin Rail into second place on price with an offer that is 15 to 20% higher than the nearest contender. FirstGroup and Virgin had been vying for the contract after the other two shortlisted bidders, Dutch-owned Abellio and a bid backed by SCNF, the French rail group, slipped out of contention. According to one rail industry rumour, the biggest bidder has offered the Department for Transport a premium – or excess profits – of between £6.5bn and £7bn over the 14-year span of the contract. While that far exceeds the premium paid by Virgin, industry observers believe £5bn would be a par bid for one of the most sought-after franchises on the British rail network. FirstGroup, which has a strong reputation for cost management and owns three franchises including First Great Western, is believed to have looked closely at the running costs on the west coast service. Last month the RMT trade union, the largest rail union, warned that bidders were considering severe cuts to onboard catering to achieve higher premium payments. While Virgin pays about £160m per year to the DfT, a bid of up to £7bn would require annual payments of about £500m. FirstGroup is rumoured to have considered staff cost cuts of about 20% on west coast, which could include cutting catering numbers from approximately 800 people to 300, or the service outsourced. A hefty premium profile is also likely to draw the scrutiny of investors, who are paying close attention FirstGroup's attempts to whittle down its £1.8bn debt burden. A plan to raise £100m from bus company disposals has hit a snag after Stagecoach withdrew from the purchase of FirstGroup's Devon bus business after the Office of Fair Trading raised concerns over the agreement. Although a small deal, it was viewed as a negative development by analysts because of the prospect of the OFT and Competition Commission intervening in every disposal. According to City sources, there are also concerns among investors that FirstGroup will have to launch a rights issue to reduce the debt, a development that may be viewed dimly if it is perceived to divert shareholder cash into lending banks rather than into the business. However, the share price does not indicate serious concerns over FirstGroup's debt with the stock trading at about six times earnings, whereas if there was genuine alarm the shares would be trading at two to three times earnings. FirstGroup said: "We do not comment on speculation or market rumours of any kind. All decisions relating to the tendering of rail franchises are the responsibility of the Department for Transport." Virgin Rail said: "We do not comment on our franchise bids." If Virgin loses out to FirstGroup, it will be the first time that Sir Richard Branson, co-owner of the business, has been out of the UK rail business in 15 years. 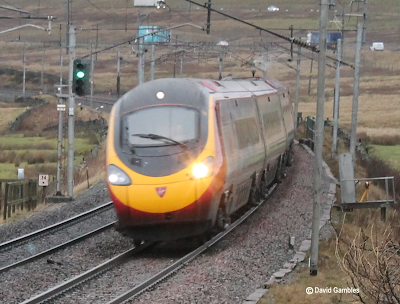 Virgin Rail launched in 1997 and a year later was drawing record complaints from passengers. It is now a popular service and carried 30 million people last year. A final decision on the contract is expected in August.